What Is So Special About The Blending Sponge? The first thing to know about a blending sponge is why such a simple thing is considered as the secret to perfect makeup. Well, the precise answer is, it helps in blending out your base makeup seamlessly. Blending sponge is a versatile makeup tool, which makes the application of foundation, regular moisturizer, tinted moisturizer, BB cream, CC cream, concealer, etc. absolutely easy and effortless. When it comes to getting an airbrushed, dewy, flawless finish, this small piece of sponge works just like a ‘miracle product’. The best part of using a blending sponge is that it creates a finish that is not achievable by using makeup brushes alone. Hence, it has become a go-to choice for both makeup beginners and pros. Blending sponges are available in a variety of shapes and sizes. 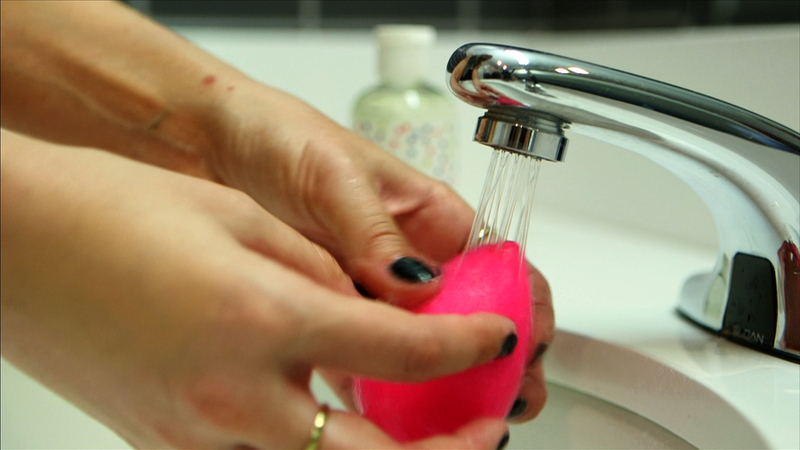 However, the egg-shaped, pink sponge called ‘Beautyblender’ is the most popular one among them. 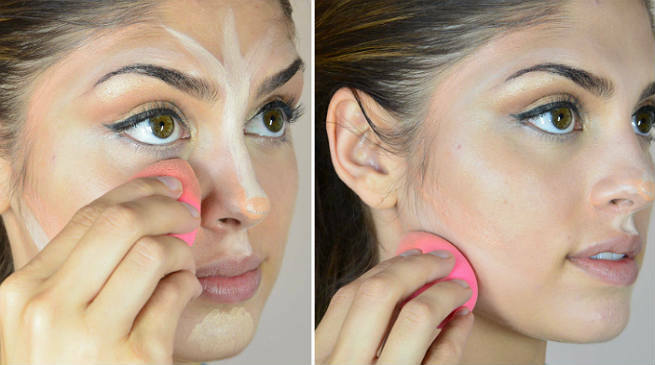 If you are using your blending sponge dry, you are doing the biggest mistake ever. No matter how much time it saves, if you skip dampening the tool right before using, the chances are big that you will end up creating a ‘cake face’. A dry and dehydrated sponge makes the heavy makeup even heavier by sucking it up. On the other hand, a damp sponge turns bigger, softer, and less thirsty, which makes the makeup lighter and pushes it out into the face for a perfect streak-free blending as well as a dewy finish. If you are pouring your makeup (specifically the water-based ones) directly onto the blending sponge, you are doing it wrong. It is always good to apply makeup little at a time and layer gradually as you go ahead. Covering the entire sponge with foundation will not only make your task of application tough but also cause loss of product as the sponge will absorb it immediately. If you are tapping the foundation on your skin lightly with the blending sponge, you need to rectify it right now. The tool can only work the best when you press it into the skin along with the makeup. The motion of delicate pouncing should be replaced with ‘pressing’ or ‘dabbing’ in order to get a flawless finish. Run the blending sponge under water for at least 20 seconds while squeezing it gently. Once the tool gets completely wet, it will become softer, fluffier, and larger. Now, squeeze the excess water out or simply soak it up by using a soft towel. The sponge must not be sopping wet but there should be a dash of moisture left inside. Pump out a little foundation on the back of your hand (or any other flat hard surface of your choice) and dip a part of the sponge into it to pick up the product. Do not take too much foundation at a time on the sponge. Rather, apply slowly and keep layering as needed. Apply the makeup to the skin by using the blending sponge in small, gentle strokes. Then, stipple or bounce the tool all over your face for seamless blending. Make sure that you apply slight pressure while tapping it against the skin. For spot treatment, apply concealer to the affected part of the skin by patting with your ring finger. Then, blend it nicely by using a corner of the blending sponge. In the case of Beautyblender, the pointed edge will make your task easy. It is important to clean the blending sponge after each use with a mild liquid cleanser. Once it is air-dried, put it inside the container it came in and store in your makeup kit.